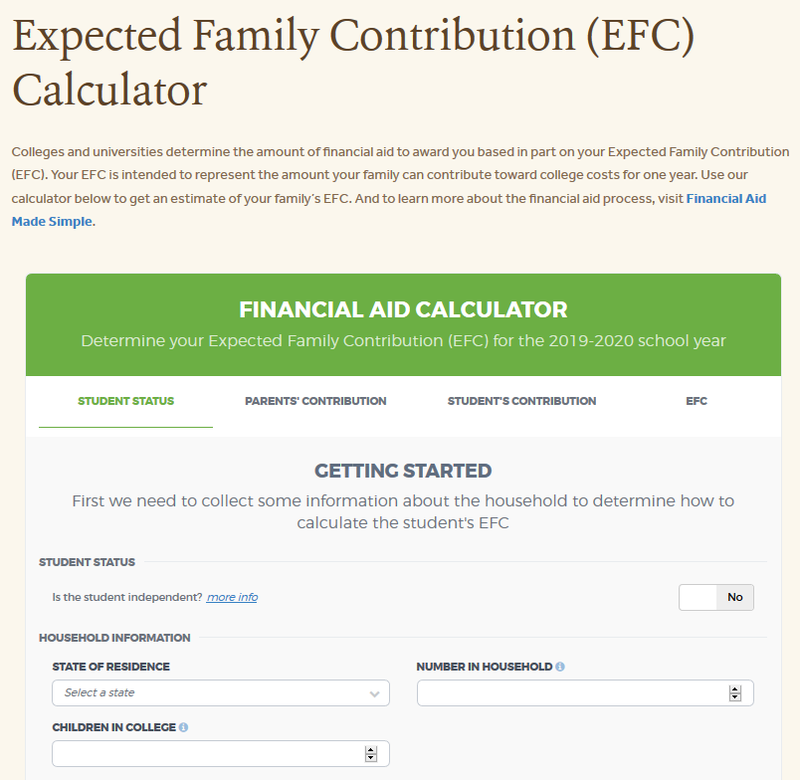 In our continued efforts to help families make an informed plan to pay for college costs, we recently launched an Expected Family Contribution (EFC) Calculator. The EFC Calculator allows you to type in information about your family’s finances and receive an estimate of your EFC. The EFC is key to the financial aid process, as it’s intended to represent the amount that your family can pay for college costs for one year. It’s simply an estimate, and doesn’t actually represent what your family will pay for college. But it’s used by financial aid offices to determine the amount of college expenses you (allegedly) have the ability to pay for, and, as a result, the amount of financial aid for which you are eligible. You can learn more about that process here. Type in your state of residence, the number of people in your household, and the number of children you anticipate to be in college. Even if your children are younger, indicate that you have at least one child in college, as that will be the case when you calculate your actual EFC. 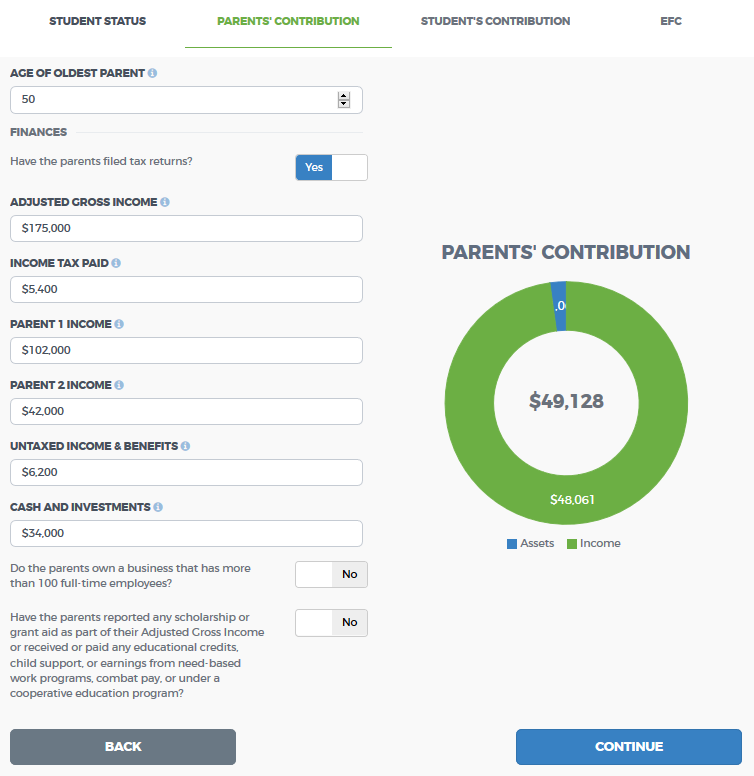 Next you’ll fill in information about the finances of the student’s parents. The image on the right showcases the calculated parent contribution toward the EFC. And the different colors of blue and green distinguish the amount of the EFC calculated from income and the amount calculated from assets. You can see here that the EFC is heavily driven by income rather than assets. 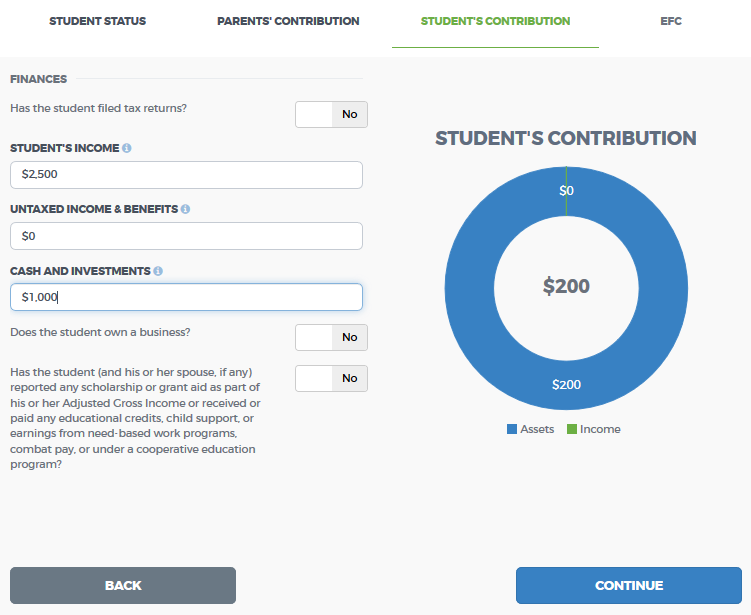 Next you’ll fill in financial information for the student. And finally, the calculator will present you with your EFC. You can play around with the calculator over and over, especially if you’re considering a job change or a significant decrease in your assets. And remember, if you don’t yet have a child going to college, your information might be different once it’s time to send someone to campus. But this tool can give you an idea of what colleges might expect you to contribute toward college costs when that time comes. If you have questions about the calculator, or the financial aid process in general, we’re happy to help. Call us at (800) 449-MEFA (6332) or email us at collegeplanning@mefa.org.